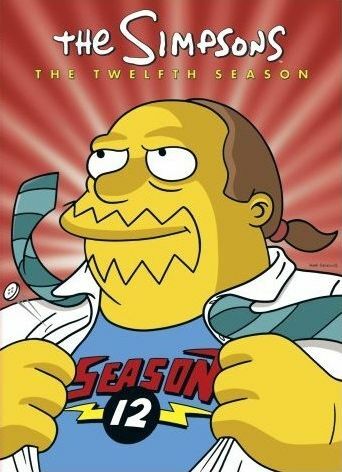 The twelfth season of the Simpsons was recently released on DVD, and like the previous eleven season, I had to get it. I love this show, and still watch it today despite my feelings that it has slowly been going downhill ever since it reached its peak around seasons three and four. I know it must be extremely hard to come up with new stories and new jokes after so many seasons, so I'm okay with some of the weird jokes they throw in now and then, such as the one where Homer takes forever to go to work through traffic only to realize the parking lot is directly behind his house. It's a totally crazy joke that doesn't fit in with the continuity whatsoever, but it's hilarious. This twelfth season takes that craziness to a whole new level. The first episode is the Halloween special, Treehouse of Horror XI, where crazy jokes are expected. And this one, like all the rest, delivers with three short stories, G-G-Ghost D-D-Dad , Scary Tales Can Come True , and Night of the Dolphin . Of the three, G-G-Ghost D-D-Dad is my favorite, where Homer's horoscope specifically says that he will die today, so he goes all day encountering a bunch of funny close calls with him just shrugging it off. Of course he eventually does kick the bucket, but is sent back as a ghost in order to do one good deed... all of which go hilariously wrong. The second episode is one of those packed with craziness. The basic plot is that the town splits in two, New Springfield and Olde Springfield. But before any of that, the episode starts off with a wild badger taking over the doghouse, which gives us a crazy joke about Homer's gut being completely ripped open to reveal his internal organs, and then the badger peaking in the window because everybody forgot about him and Homer telling him to go away because they have bigger issues to deal with. The later there's a giant garbage wall separating the two towns, and a cameo appearance by The Who for no apparent reason. And at the end, a bunch of talking badgers for some reason. Skinner's Sense of Snow is another weird one, where all the elementary school gets snowed in, trapping Principle Skinner and all the kids inside. Sounds like it could have been a legit, sane episode with various mischief or events attempting to escape or just alleviate boredom. Instead, none of the other teachers are in the school, and so it turns into a Skinner versus the kids episode that has an unsatisfactory conclusion. Skinner pushes a hamster in a ball with a note out one of the windows (kids could have got out that way too, but whatever) hoping someone will find it, and sure enough it runs into Homer and Flanders who crashed into a fire hydrant causing them to become iced in, while leaving the engine running and hallucination from the fumes. So eventually the hamster ball breaks the windshield, releasing the fumes and somehow magically causing all the ice to break so they can continue on... and crash into a giant salt silo which melts all the snow in front of the school and also causes the sun to come out. Total cop out. HOMЯ, while funny, involves Homer having a crayon shoved into his brain, Worst Episode Ever involves Comic Book Guy dating Agnis, Skinner's mother, Tennis the Menace felt like just an excuse to get famous tennis players to do voices for the show, Day of the Jackanapes actually blows up some network executives only to have them reconstitute like the liquid metal Terminator in Terminator 2: Judgement Day, New Kids on the Blecch has Bart and pals form a boy band that's actually a military recruiting ploy, and Simpson Safari has the family going to Africa where they discover that Dr. Bushwell is using chimps as slave labor. So yeah, a whole lot of weirdness in this season. This is not to say that this isn't a funny season, because it is, and it's definitely worth having. I'm just saying that this is probably the season where I'd say it went from a 5-star show to a 4-star show. But as always, the DVDs are great. Most episodes contain deleted scenes, and every episode contains a full length commentary by a whole bunch of people. I have to say that Simpsons commentaries are some of the best around. The people talk about the history and the making of and current issues and just joke around and laugh. They are very entertaining, enabling you to get twice as much entertainment out of each disc.